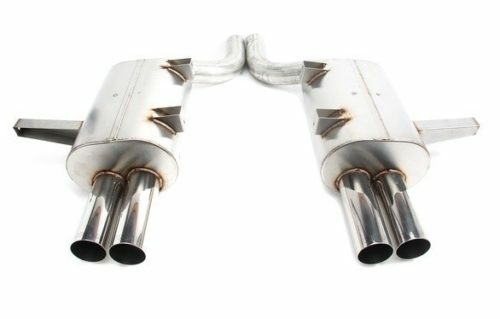 Dinan's Free Flow Exhaust for the M5 provides improved flow and the resulting power gains without the excessive noise associated with typical "after-market" mufflers. Dinan’s Free Flow Exhaust for the M5 provides improved flow and the resulting power gains without the excessive noise associated with typical “after-market” mufflers. 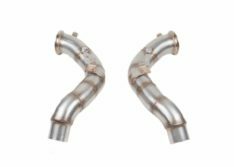 The Dinan exhaust features a rigid and durable muffler case, manufactured from 20 gauge-304 stainless steel for optimum resistance to corrosion. 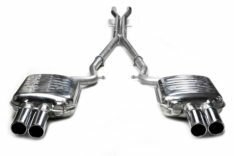 Internally, the systems feature Dinan’s Tuned Resonance Chamber Technology, providing the optimum balance between maximum power gains and a civilized, yet sporty exhaust note. The system also reduces weight substantially, weighing in at only 37.6 lbs. as compared to the stock system at 66 lbs. 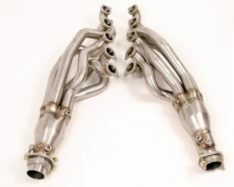 Dual 3-inch diameter polished stainless tips give the cars a tasteful performance look as well. Dyno results for the combination of Stage 2 Engine Software; Cold Air Intake and Free Flow Exhaust.